A circus-themed, big top, immersive production of the West End and Broadway hit 70s musical plus foyer entertainers including jugglers & magicians and a pre-show curtain-raiser from Little Stars Circus. West End and Broadway rock musical GODSPELL bursts onto the stage, set in a live human circus with this brand new, high energy production, bringing the story of Jesus and his disciples to life in a spectacular immersive setting. Join us for a dazzling event for all the family, with an hour of pre-show entertainment before the main show starring the one and only Chesney Hawkes and from X Factor Sam Callahan which will enthral you with a series of stories and songs. 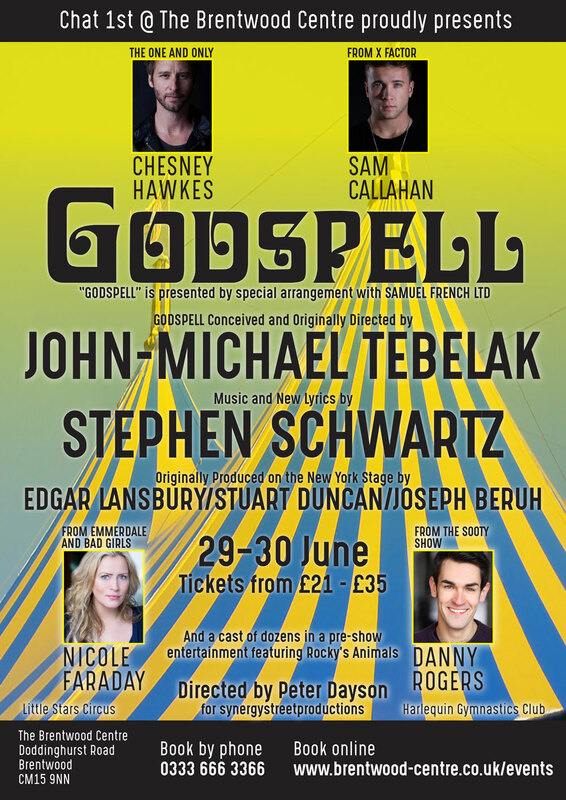 GODSPELL was written by Grammy and Academy Award-winning Stephen Schwartz, also known for WICKED, and features rock 'n roll, pop, R&B, ragtime, rap and much more. The show tells the Bible story, right up until the Crucifixion and Resurrection whilst asking us all to think about our own lives, how we live with our neighbours and how we can make their lives better. This timeless tale of friendship, loyalty, and love has touched the hearts of countless theatregoers all over the world don’t miss out on the chance to see it local and live! In April 2018, The Brentwood Centre produced our first ever in-house show, Joseph and the Amazing Technicolor Dreamcoat. With over 100 on stage and many more behind the scenes, this production brought the community together and sold out two performances. Many in the choir, as well as the show's Producer, talked of the benefits to their mental health and several actors have returned to the stage in other shows after absences, that we quickly decided that we must do it all over again, except perhaps this time, it could be even bigger. A hit in the 1970s, and very controversial at the time, GODSPELL tells the story of Jesus Christ and his disciples through the parables of St Matthew's gospel. Depicting Christ as a clown upset many in the 70's but whether or not you have a faith, the story of love between a group of friends brought together when the world seems to be on the verge of collapse still rings so true today. With songs such as Day by Day and Prepare Ye, a mixture of community and professional singers - some you will know from the TV who we will announce shortly - will entertain you with this wonderful story. Food providers including our regular burger van will be open an hour before curtain up, so please make use of our free parking. to come along for this pre-show entertainment. The Brentwood Centre is aiming to be the most accessible sports and leisure facility in the country and for this production, we will be providing seating for those with any special need. Please book the un-numbered seats on either side of the stage and in due course, one of the team will be in touch to discuss how we can make your visit as comfortable as possible. The show will be 'in the round' so everyone will get a great view. We believe in the community which is why our cast is being sought from a wide range of backgrounds. Even though many may think that death and resurrection is a difficult concept for young people to understand, our Director Pete Dayson has taken a production of GODSPELL into the West End with children and especially those with special needs and they loved every minute. The production will be produced by Mark Reed on behalf of Brentwood Leisure Trading Ltd, a wholly owned subsidiary of Brentwood Leisure Trust.